I’m a long time fan of infographics as they can provide a truly engaging way to present data in a visual and easy-to-understand way. I feel the same way about comics as a similar format to convey information with the additional benefit of creating empathy with your audience while educating and entertaining them. However, all that text in graphics is a big no-no. Be mindful of SEO and people using assistive devices such as screen readers, text-to-speech for people with cognitive impairment, and refreshable Braille devices, when posting infographics and comics. Currently, search engines can’t read and index text in images. And people using accessible devices rely on webmasters to take the time to properly describe images. Add an intro paragraph or an outro paragraph. As long as it’s descriptive of the information in the graphic. In web accessibility circles, this is known as providing a “long text alternative”. Use the keywords your audience is using and other SEO best practices. This way, Google will be satisfied and most importantly, people using assistive devices can enjoy your content. As of this writing, Google likes to give higher rankings to pages with at least 300 words. That may sound like a lot of text to introduce a comic or infographic but really, the quality of your content is what matters now. So make sure your content is worth your audience’s attention in the first place! It’s important to fill in those ALT and TITLE tags your CMS asks you to when posting images. People using assistive devices will understand what the image is about and what to expect when they click on it. You’ll also generate a little more SEO to give your page some more potential higher search rankings. Win-win. But don’t just write “comic”, “image”, “infographic”, or repeat your blog title in the ALT tag. Describe what’s going on in the image. Something along the lines of “This is an infographic using a tree analogy to explain the steps a financial advisor can take to avoid risk”. You can use the TITLE tag to explain what users should expect after clicking on the image if the image is clickable. When you have nothing to say about an image, simply write “null” in the ALT tag and assistive devices will skip it. According to Hobo Internet Marketing, Google doesn’t like it when ALT tags are stuffed with a lot of keywords. Avoid doing this to avoid being penalized. Hobo recommends using one keyword and up to 16 words (this is around 156 characters). 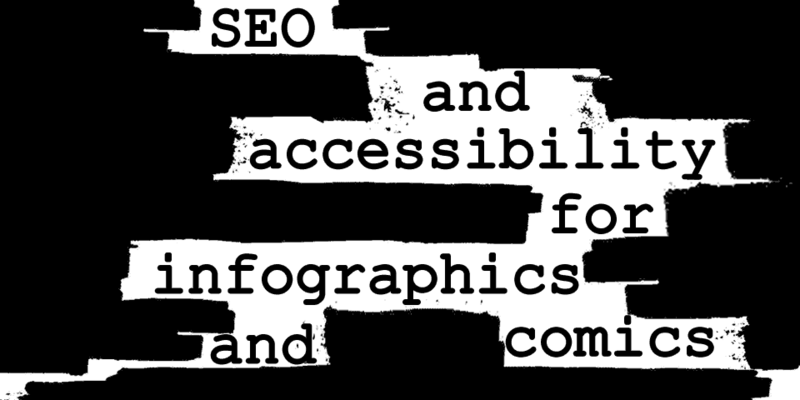 Media Access Australia has a thorough guide to using ALT and TITLE tags as well as other methods for creating a fully accessible infographic which can also be applied to comics. For example, using colours for people with colour blindness, vision or age-related impairments who may not be able to read text when there isn’t enough contrast between foreground and background colours. What methods do you use to ensure your infographics or comics, or any kind of visual, are search engine optimized and accessible to all users?